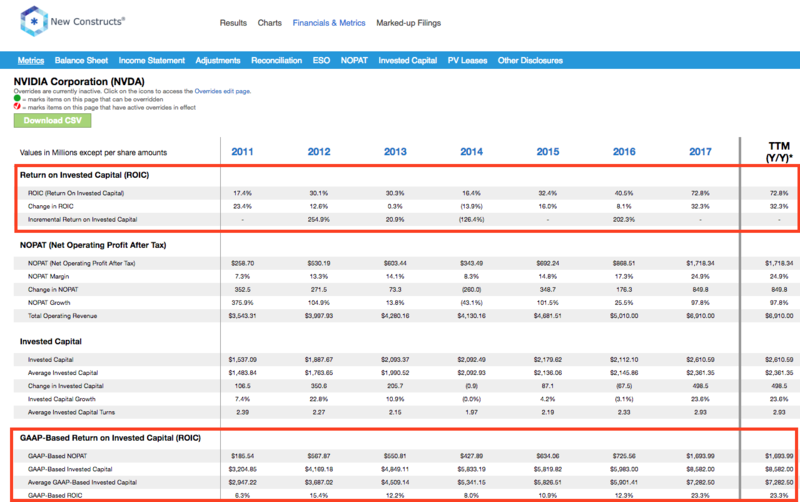 GAAP-based ROIC (seen in Figure 1) is based on a simplified after-tax profit (NOPAT) and invested capital that can easily be calculated using only the income statement and balance sheet. Many of our competitors employ this simplified approach to ROIC because it allows them to automatically calculate ROIC for large numbers of companies. In short, this approach sacrifices analytical rigor for speed and simplicity. We provide the GAAP-based ROIC to show how our ROIC differs and to feature the impact of numerous adjustments we make from details buried in the footnotes and MD&A of 10-Ks. Our Robo-Analyst technology enables us to perform the diligence needed to calculate an accurate ROIC with scale. We make it easy for the average investor to leverage the benefits of a high quality ROIC model and see a clear picture of a firm’s true profitability. Figure 2 shows the Russell 1000 companies with the largest positive and negative difference between GAAP-based ROIC and our ROIC. Figure 2 highlights the importance of looking beyond the income statement and balance sheet when assessing a firm’s profitability. Relying on a GAAP-based ROIC leads investors to believe that HP Inc. (HPQ), with its 133% GAAP-based ROIC, is significantly more profitable than Apple Inc. (AAPL), which earns just a 20% GAAP-based ROIC. Overlooking numerous GAAP loopholes and distortions leads to an inflated view of HPQ’s profitability. 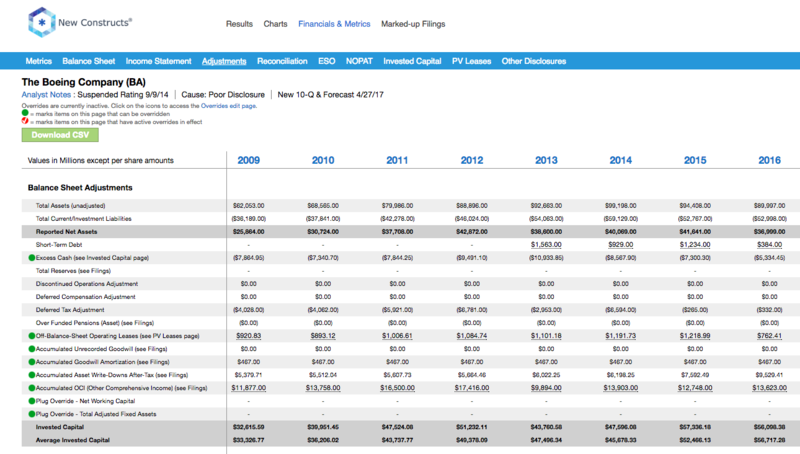 See HP’s ROIC and GAAP-based ROIC each year dating back to 2010 here. GAAP-based ROIC doesn’t account for HPQ’s $21 billion in asset write-downs, a charge we include when calculating invested capital. At the same time, GAAP-based ROIC includes Apple’s $233 billion in excess cash. We remove excess cash when calculating invested capital because it is not needed for the operations of the business. 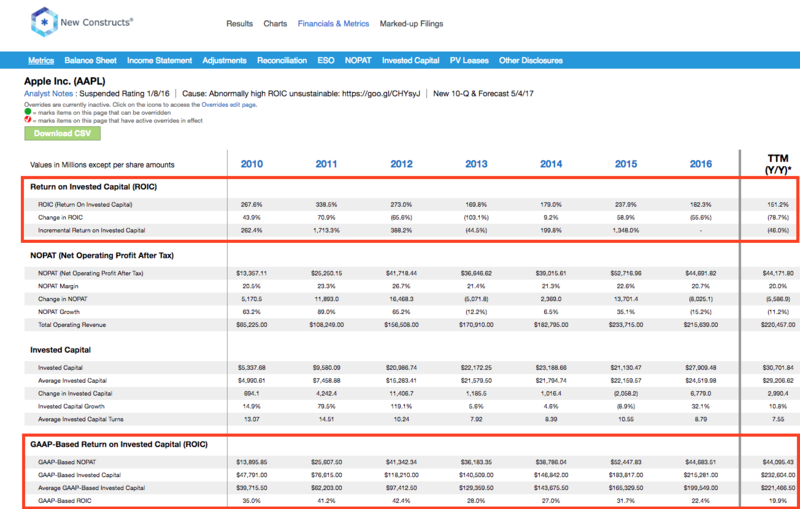 See Apple’s ROIC and GAAP-based ROIC each year dating back to 2010 here. Mastercard (MA), Intuitive Surgical (ISRG), F5 Networks (FFIV) and NVIDIA Corporation (NVDA) earn the second through fifth highest difference in GAAP-based ROIC and ROIC. NVDA was featured as a Long Idea in September 2015, in large part due to its impressive ROIC. Relying on the GAAP-based ROIC leads to an understated view of its true profitability and created an opportunity for more rigorous investors. Since publishing the September Long Idea on NVDA, the stock is up 417% while the S&P is up just 24%. 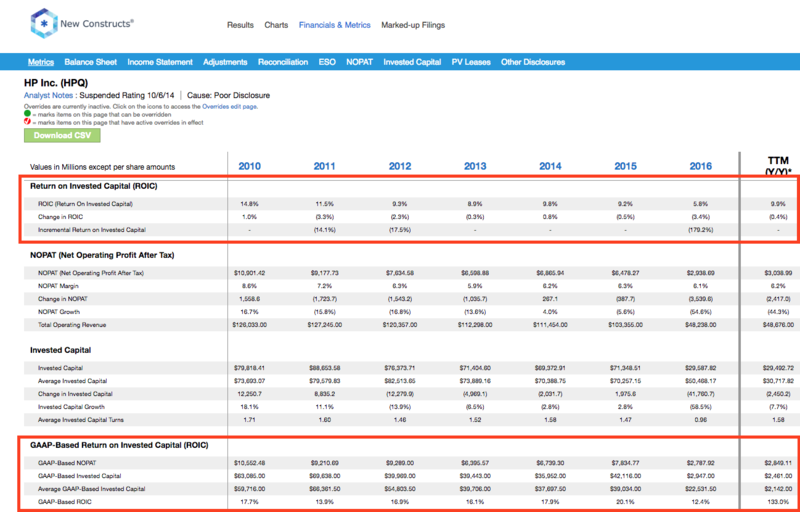 See NVIDIA’s ROIC and GAAP-based ROIC each year dating back to 2011 here. HP Inc. earns the largest negative difference in GAAP-based ROIC and ROIC. VeriSign (VRSN), The Boeing Company (BA), ServiceNow (NOW), and Domino’s Pizza (DPZ) round out the five largest negative discrepancies. Boeing’s GAAP-based ROIC overlooks $9.5 billion in asset write-downs and nearly $14 billion in accumulated other comprehensive income. See the adjustments page of our model of Boeing Company, where we show the adjustments to calculate invested capital.